Our recent trip to France involved a river cruise of the Rhone from the Cote d’Azur to Lyon and a land portion to Paris. We traveled on Avalon Waterways and highly recommend them for this type of cruising. We were equally impressed with Avalon several years ago when we embarked on a similar cruise from Amsterdam to Budapest. Our cruise started actually from JFK airport, as we took advantage of a free airfare promotion. Our carrier on this portion was Lufthansa and we had the opportunity to experience one of the new Airbus A380s. Have to say that it was the most comfortable ride we have experienced in flying. Prior to the flight, we inquired about the cost to upgrade seats to economy plus on the JFK – Frankfurt leg. When the agent said US$275 per person, I was just about to say “forget it” when my wife said “do it”. I reluctantly handed the agent my credit card…it was worth it. From Frankfurt, we were transported to Nice, where we were bused to our hotel, the Fairmont Monte Carlo. Weather was excellent and the high was in the low 30s°C (mid 80s°F). I have to say that Avalon do not skimp on the hotels they include in their packages, both in Monaco and Paris. Monte Carlo is an administrative area of Monaco, which itself is a sovereign state bordered by France on three sides and the Mediterranean on the fourth. It is the second smallest (the Vatican being the smallest) and the most densely populated country in the world. There is no income tax there and it is a tax haven for wealthy people. It is also famous for its formula one race held in May of each year through the streets. Our hotel, needless to say, was first class with excellent amenities. It is evident that it is a playground of the wealthy when the buffet breakfast was 65€, which translates to CAN$100!! Thankfully, the breakfast for the two mornings we were there was included in our package. 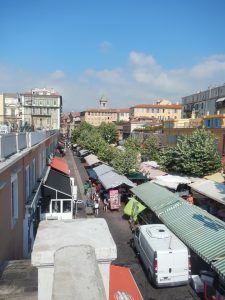 We opted for the tour to Nice the next day, boarding the bus for the 13 km trip to the second-largest city on France’s Mediterranean coast, next to Marseille. The city was known for its allure to British aristocracy who spent their winters there. Accordingly, the main seaside promenade is named Promenade des Anglais. Historically, the city has been either part of Italy or part of France, depending on the year. Finally, in 1860, it was re-annexed to France, but a lack of transportation facilities stunted any growth until the railway connected it to the rest of France. Typical narrow streets abound in the old sector of the city with numerous cafes and boutiques stores vying for your business. We spent some time in the Cours Salaya, known for its flower market as well traditional market wares. Back to Monte Carlo to freshen up for supper, which we hoped would be in some cozy French restaurant offering local delicacies. However, most of the restaurants nearby were Italian! A carryover, no doubt, from the long history of Italian dominance. We did have a very nice meal in a quaint little eatery called the Pulcinella on Rue du Portier. Back at the hotel, we decided to check out the facilities and took the elevator to the 7th floor (the main lobby is on the 3rd floor). Interestingly enough, due to the elevations, there was an exit at the seventh floor to the street. The floor had a restaurant (where we enjoyed a great breakfast buffet) and a lavish pool with Bali beds that one could rent (I didn’t ask how much). We sat at a table overlooking the harbour…it was a surreal sight…and ordered two Bailey’s on the rocks. When the bill came, it was 32€! As I said, it is a playground for the wealthy. The next day, we traveled to Arles where we were to embark on the ship. It was about a 4-hour bus trip through Aix-en-Provence (Aix pronounced eks), a university city in the Provence-Alpes-Côte d’Azur region. (Of interest is the story behind the “^” over a letter in French. Old editors of manuscripts would place the “^” over a letter where an “s” was missing. Therefore hôtel would be the misspelled form of hostel, côte for coste (or coast), rôti for rosti (or roast), pâte for paste, hôpital for hospital and forêt for forest). After a short rest stop, we joined the ship, the Avalon Affinity, in Arles. 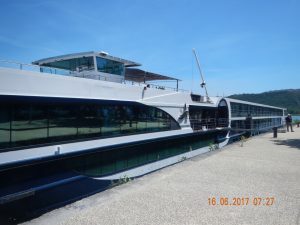 The river cruise ships are typically very long (approximately 400′), narrow (about 35′ to fit in the locks) and have only three accommodation decks. Most of the bridge stations are designed to recede into the ship combined with using ballast tanks to reduce the height to clear some of the low structures. The ship has 65 state rooms including four suites (the suites amount to 1½ regular cabins). We opted to upgrade to a suite when we arrived and it is highly recommended as the cabins tend to be smaller than those on regular cruise ships. Arles is the southernmost city on the River Rhône and just north of Europe’s largest river delta, the Carmargue Delta. Approximately one-third of the Carmargue is either lakes or marshlands. There is a distinct Roman influence in Arles, as there is in many places in France. The Arles Amphitheatre is a Roman arena similar to the Colosseum, although about two-thirds the size. Still in use today for bull fighting and other special functions, although many of the original wooden seats have been replaced with metal ones. There is also remains of the Gallo-Roman theatre and an Obelisk in front of the town hall. The famous painter, Vincent van Gogh was fascinated with the Provençal landscape and produced over 300 paintings while there. It was there also that the well-known ear-severing incident happened and he was eventually committed to an asylum. 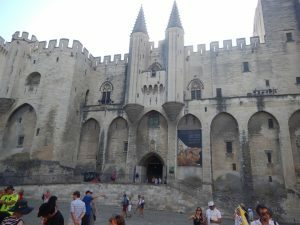 Our next stop on the Rhône was Avignon, an interesting city famous mostly for being the seat of the Catholic Popes from 1309 to 1377. Again, temperatures during the day were expected to be in the low 30s and the Mistral winds were welcome. This wind, approaching speeds of over 100 km/h, is accelerated by the venturi effect of the Rhône valley as it blows from north to south. The ancient town centre, enclosed by medieval ramparts, still has about 12,000 inhabitants and includes the Palais des Papes, the Notre-Dame des Doms Cathedral and Pont d’Avignon (featured in a famous French song, sur le pont d’Avignon). Avignon has 173 sites and buildings that are registered as historic monuments. The famous Avignon Bridge has only four of its original 22 arches still standing, the rest being demolished over the years by the forces of the Rhône River. The Cathedral of Our Lady of Doms is a Romanesque building built in the second half of the twelfth century. The most prominent feature of the cathedral is a gilded statue of the Virgin Mary atop the bell tower which was erected in 1859. It also contains the mausoleum of Pope John XXII who died in 1334. Located next to the Cathedral, the Papal Palace is an impressive monument begun in 1316 by Pope John XXII and continued by succeeding popes until 1370 when it was finished. Occupying an area of 15,000 m² (161,400 ft²) it is the largest gothic palace in all Europe and, due to its many architectural merits, one of the most important in the world. When the popes returned to the Vatican, the building over the years fell into disrepair, being used as a barracks and prison during Napoleonic times. It has been under virtually constant renovation since it was vacated in 1906, when it became a national museum. 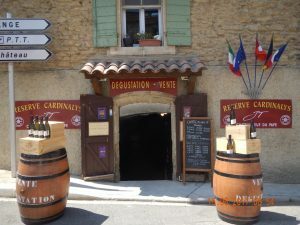 While in Avignon, we opted for the tour to the well-known wine region of Châteauneuf-du-Pape (new castle of the Pope) where we were able to tour the quaint little town and attend a wine tasting event. Historical note: most of the original grape vines were wiped out in France and around the world in the late 1800s due to the phylloxera infestation. This pest, native to North America, had made its way to Europe and other parts of the world resulting in the destruction of virtually all the original vines. North American varieties of grape vines had evolved to form natural defences to the insect and as there is no cure nor chemical control, the only way to overcome the problem is to graft phylloxera-resistant American rootstock to European stock. We tasted four wines from the region including a white wine – unusual for Châteauneuf-du-Pape (one in every sixteen bottles produced is white). The main varietal grape used in the area is the Grenache, although a combination of up to 13 varietals can be used. The region relies on the round rocks or pebbles that cover the clay soil. Heat retention by the rocks from the plentiful sun during the day, maintains the warmth of the soil and accelerates grape ripening. The relentless sun beat down on us as we walked amongst the vines and witnessed the early bunches of grapes that will be harvested in September. Our next port of call was the charming town of Viviers, which developed around its Romanesque cathedral that runs the smallest diocese in France. The old town has a mix of Christian, Roman and medieval influences. After a brisk climb through the narrow streets to the cathedral, a nice treat was the private organ recital arranged for Avalon guests. Tournon was the next location we visited and we had a walking tour of the town that, as with most small towns, was centered around a cathedral. We visited the local market that sold everything from meat and vegetables to live chickens and ducks. The main attraction is the castle/museum that sits on a rock overlooking the town and the river. We then set sail for Vienne, another small town that had historical significance in Roman times when Julius Caesar transformed it into a Roman colony around 47 BCE. There is a well preserved Roman temple, similar in style to that of the Acropolis in Greece, and a Roman pyramid that legend says is Pontius Pilate’s tomb. Another popular tourist attraction is the Gothic former cathedral of St Maurice that was built between 1052 and 1533. It is a basilica, with three aisles and an apse. The early Romanesque church of Saint Peter belonged to an ancient Benedictine abbey and was rebuilt in the ninth century, with tall square piers and two ranges of windows in the tall aisles and a notable porch. It is one of France’s oldest Christian buildings dating from the 5th century laid-out in the form of a basilica and having a large and well-constructed nave. Lyon was our next stop on the Rhône. France’s third largest city with a population of just over 500,000, it hosts the international headquarters of Interpol, Euronews and the International Agency for Research on Cancer. It is also the confluence of the two rivers, Rhône and Saône. The old city of Lyon boasts some interesting features in its narrow streets. Many streets are linked to each other through passageways in the buildings, which were used during German occupation by resistance fighters. The most notable structure is the Basilica of Notre-Dame de Fourvière built between 1872 1nd 1884. This impressive edifice stands on a hill overlooking Lyon and has a spectacular look-out point. We chose an optional tour to Pérouges, termed “A Throne on an Isolated Hill”. This small walled town has been meticulously preserved to maintain the medieval nature and walking around this site is like a trip back in history. The town still has a population of about 1,200, which is the highest recorded since its inauguration. Its authentic depiction of a medieval town (there is no evidence of modern facilities such as electrical wiring and streetlights, but it is there and integrated into the architecture), it has been frequently used by filmmakers. 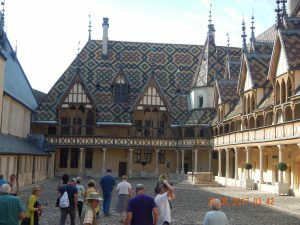 Hospices de Beaune consists of a pair of two-storied buildings arranged around a stone courtyard. The building wings are well-preserved today; they contain half-timber galleries and ornate rooftops with dormer windows. Of notable interest is the polychrome roof made up of a variety of coloured roof tiles. Leaving Beaune, we were transported to Dijon, where the architecture is distinguished by, among other things, toits bourguignons (Burgundian polychrome roofs) made of tiles glazed in terracotta, green, yellow and black and arranged in geometric patterns similar to the Hospice de Beaune. This is where we boarded the TGV (Train à Grande Vitesse) to Paris. The first 30 minutes of the journey was not at high speed until we passed Montbard, but then it really flew! Apparently, the trains regularly achieve speeds of up to 320 Km/h (200 mph). When running parallel to the highway (where speed limits are 130 km/h), it was evident that the train was travelling at least twice the speed of the traffic. We arrived in Paris at Gare Lyon, where we boarded buses to take us to our hotel, L’Hotel du Connectionneur. Again, the hotel was 5-star and was located within a short walk to the Champs Elysées and the Arc de Triomphe. There is not a lot to say about Paris that hasn’t been said before, but it is certainly a beautiful city, with a multitude of attractions even beyond the iconic Eiffel Tower, Arc de Triomphe, Champs Elysées and Louvre Museum. We did, as part of the cruise program, take a bus tour of the City to include most of the important sights, including all those above. However, one of the big attractions in the area is the Palace of Versailles, also known locally as Château de Versailles. The difference between a ‘Château’ and a ‘Palace’ is primarily in the intended function. A Château was a castle and thus had fortifications to repel attackers. A Palace was a luxury residence for royalty or very wealthy people. Therefore, ‘Palace’ would be a more apt term for this building. 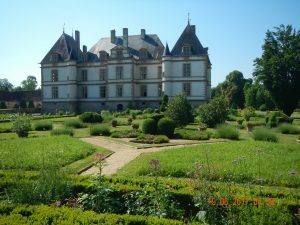 First built by Louis XIII in 1623 as a hunting lodge, it was enlarged into a Palace by Louis XIV later in the century. 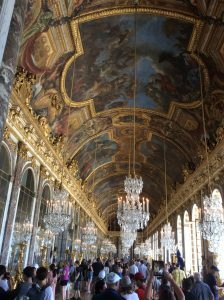 The extravagance of the Palace was such that it became a symbol of wealth and a target during the French Revolution that eventually brought down the monarchy. One of the reasons we wanted to go to France was the opportunity to visit Vimy, where a tribute to Canadian soldiers in the First World War is marked by the Canadian National Vimy Memorial. The town of Vimy is about 170 km (106 mi) from Paris and we took another TGV train to Arras (50 minutes compared with 2 hours by car), the closest station to the site (about 10 km or 6 mi). Arras is a very interesting town and unlike many French words, the letter ‘s’ should be pronounced. By the end of World War I, the city was so heavily damaged that three quarters had to be rebuilt. The reconstruction was extremely costly, yet it proved to be a success and allowed the city to expand. We were able to hire a taxi to take us to the Vimy facility and back, which, other than an organized tour (only on Mondays from Paris), is the best option. The monument and the museum are impressive and provide a great insight into the conditions at the time, as well as details of the battle and the strategic importance of the ridge. My wife’s father served in the military at Vimy during the famous taking of the ridge in April of 1917 and this year represents the 100th anniversary of that battle. 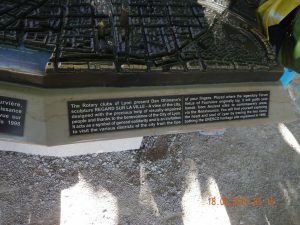 The event is commonly highlighted as a turning point in Canadian history, where the four Canadian divisions fought together as a unified fighting force for the first time. While 3,598 Canadian soldiers were killed during the battle, the impressive victory over German forces is often cited as the beginning of Canada’s evolution from dominion to independent nation. Before taking the train back to Paris, we spent some time touring Arras, which has two main squares, one of which includes the splendid Town Hall and its Belfry (listed as an UNESCO World Heritage Site). We had an excellent late lunch while there at Le Ch’ti Charivari, which is one of a chain of about 15 restaurants throughout France. We spent the rest of our time in Paris walking some of the streets and along the Seine, listening to street musicians on the Champs Elysées and sampling some of the local delicacies. We left Paris after 15 days of spectacular touring of some of the highlights of Burgundy and Provence. We highly recommend this form of travel (river cruise) as it allows you access to some of the historic sites that mostly developed around major rivers, as riverine traffic was the method of transportation in ancient and medieval times. Our journey back to Ottawa turned out to be hectic, as the cruise portion of the airfare took us to New York’s JFK and we had a second trip to Ottawa via Toronto. We panicked in Brussels when we ran into a sea of people held up at border control…and we joined the line when we were supposed to be boarding! There had to 1,000+ people waiting and my wife diligently pushed her way halfway down the line. The situation was, to my mind, unacceptable when of the four wickets available, only two were staffed by border agents. We cleared the wicket about five minutes before our scheduled departure and were sure we would miss the flight to JFK. I ran to the gate, which was B40, and when I got to the ‘B’ gates, it of course started at B01! As far as I could see along the corridor, I could only make out B19, so I ran as much as I could until I got to B40…and they were expecting me. Apparently, many people were held up at the border control and they delayed the flight. We arrived in JFK in plenty of time (over 4 hours) to make our Toronto flight…or so we thought. Thankfully, we had over three hours in Toronto…or so we thought. The flight was delayed to 7:00 p.m. due to thunderstorms in Toronto…which would make it very tight to make the 9:00 p.m. flight. After leaving the gate we got the announcement that someone had left the plane to take advantage of a $500 overbooking payment, but their luggage was not taken off the plane! It took close to an hour before airport authorities were able to locate and remove the luggage. For sure now we were not going to make our Ottawa flight. Arriving in Toronto, we tried to get a later flight both on WestJet or Air Canada, but due to the delayed and cancelled flights as a result of the storm, all available seats were taken. It was Monday night at about 11:00 p.m. and we asked when was the next flight we could take to Ottawa, thinking we could take a room for the night and get out Tuesday. The answer was Wednesday! We were not going to stay in Toronto for two days, so we opted to rent a car and drive back to Ottawa…we arrived home about 6:00 a.m. after being up for over 30 hours.